Very hard to find out-of-print keepsake journal! 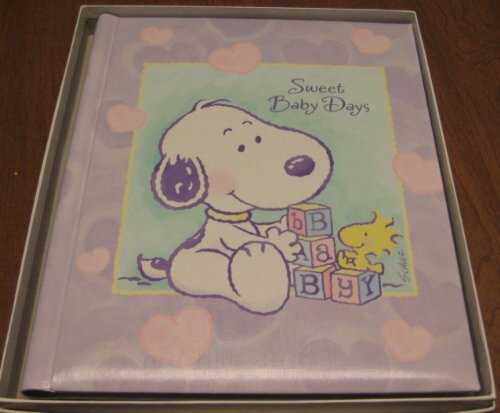 Hallmark Little BABY SNOOPY Memory Album. Deluxe album is gift-boxed and measures approx. 11" x 9" - it is spiral bound inside, hard bound padded covers outside! It comes with many BABY SNOOPY decorated pages to fill out and also scrapbook & photo pages - for example: Sonogram, Showers, Gifts, The Big Event, All About Baby, Baby's First Day, Baby's World (photos of first home, first room), Birth Certificate, Announcements, Little Hands and Feet, Guests, Current Events, Family Tree, All About Mommy, All About Daddy, Early Travels, Spiritual Life, Doctors Visits, Growth Chart, Dental Chart and MANY more! Also includes 3 full-size photo sheets (6 pages). Shipping will include tracking number and Insurance..
Hallmark Album Measures 9" x 11"
Deluxe padded covers - front reads: "SWEET BABY DAYS"